"Sometimes people write novels and they just be so wordy and so self-absorbed. I am not a fan of books. I would never want a book's autograph." That's good, Kanye, since it's a right pain to get a book to even hold a pen, much less autograph itself. Anyhoo, after banging my head against the desk and weeping for future generations, I decided that today we should celebrate those authors and illustrators who made (and make) reading so much fun during our early years. 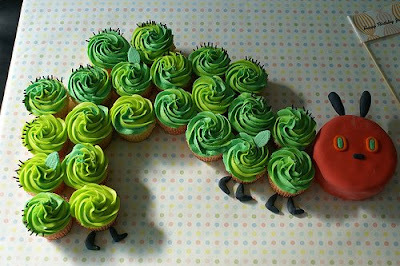 Remember The Very Hungry Caterpillar ? [swooning] Just lookit those teensy little feet! And how perfectly the greens swirl together! That's Moishe of Where the Wild Things Are . I like how the curtain goes from 2D to 3D - very nice. 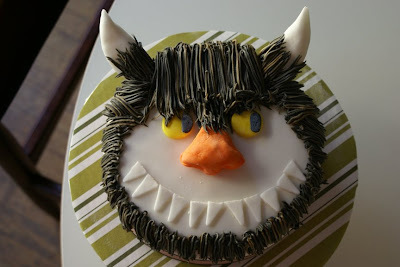 This was made by her friend Stacey, and you can see more pictures of it and the party here. I love everything: the colors, the outlining, the garland... just exquisite. 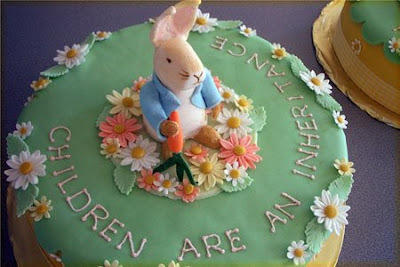 And finally, how about a little love for Beatrix Potter's Peter Rabbit? He looks like felt, doesn't he? That's some gorgeous figure modeling! Hope you enjoyed these sweet selections, guys! Now please, go find a kid and read something together, k? 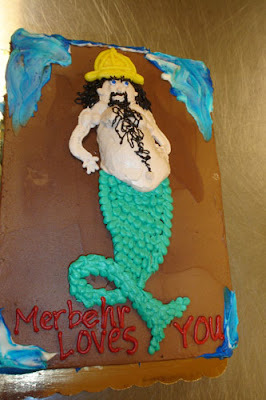 How about a construction worker merman? 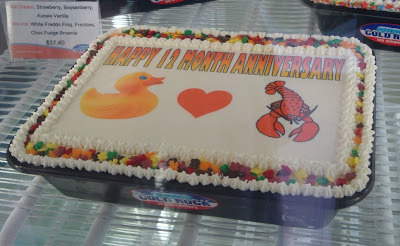 I would pick on the redundancy of "12 month anniversary", but frankly I'm more concerned over this being a stock design. Just how many people out there are encouraging relationships between their seafood and bath toys, anyway? Or how about this gem from last St. Patrick's Day? 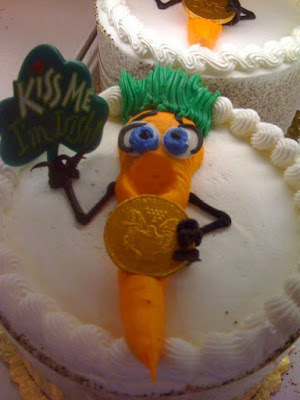 You're really giving me some mixed signals here, Mr. Rich Irish Carrot. I mean, first you offer me monetary incentive to kiss you, but then you go and look all horrified by my appearance. Ok, so maybe I don't look my best right now, but it's still kind of rude to shield your sensitive regions* with that coin. Now pucker up, blue-eyes, or I'll sic my Carrot Jockeys on you. *Wait a minute - this is a carrot. Isn't the whole thing a "sensitive region"? Or just melting over an inner tube while covered with a gigantic straw hat. Well, he does look relaxed. [staring some more] Ok, I give up. What is that red square supposed to be? Anyone? Anyone? Thanks to Alan R., the only Wreckporter brave enough to attach his name to any of these submissions, and all you other Anony Mice. 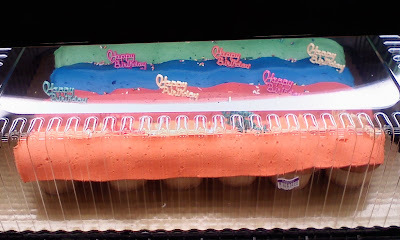 There was a time when I was accused of excessive harping on the evil that is the Cupcake Cake (CCC, for short). So, I piped down (pun intended). However, since more of you newbie Wrecktators are asking me what a CCC is, I believe the time has come for a refresher course. I can't have you lackeys out there fighting Wreckage you don't fully understand, now, can I? Now gather 'round, and prepare to have your innocence shattered. Just look at this hulking terror, poised to pounce on common decency and smother it with its blue-smeared putrescence. Back away slowly, now, and no one will get hurt. She looks ready to stomp her way downtown and gobble up some taxi cabs, doesn't she? I particularly like the concave face, though: it lends a little "Le Neanderthal Chic". 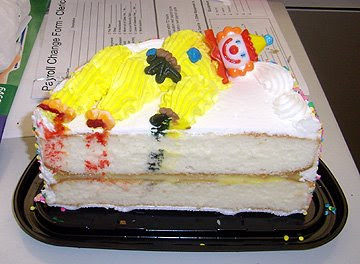 Since most large chain bakeries require their bakers to make CCCs, decorators have learned to cope with these horrors in a variety of ways. 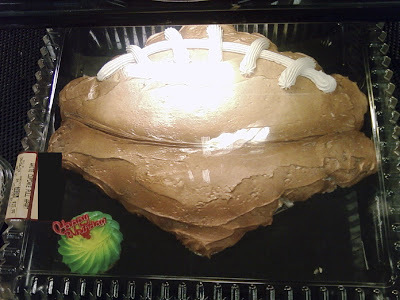 "I will make a football out of cupcakes. I WILL!!!" 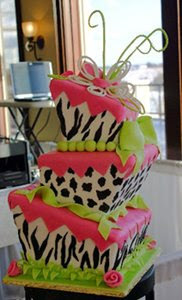 "Cupcake Cake? Where? 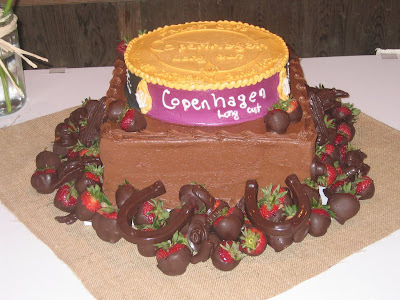 I don't know what you mean; this here is just a simple layer cake. With candles. 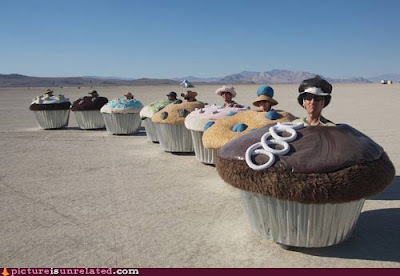 Yep, no cupcakes here! 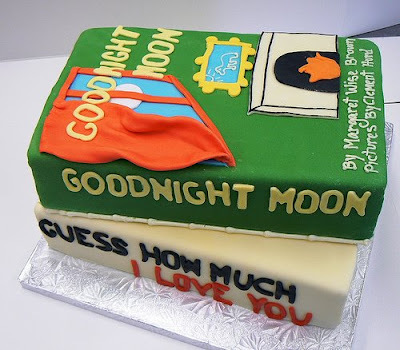 La Tee Da..."
"It is a sheet cake. It IS! 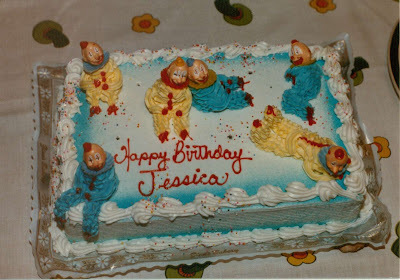 Now hand me that bucket of 'Happy Birthday' picks; I think I missed a spot." Kristi M., Vanessa H., Laura H., Sharon P., Jeremy P., Misty K., & Regina H., I think we need to step up our Anti-CCC efforts. These things are getting worse! 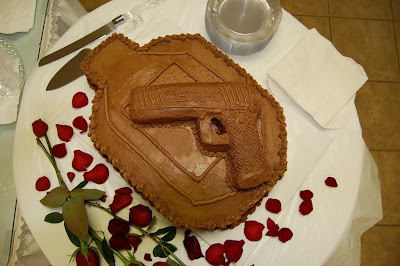 Today, class, we're going to review the art of cake inscriptions, as well as some problem-solving techniques that will come in handy while on the job. 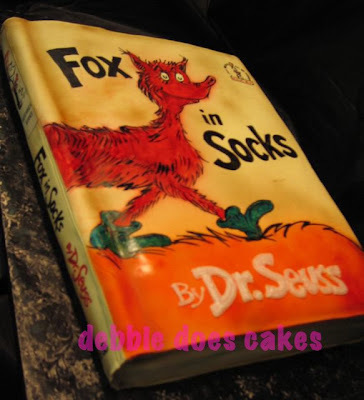 Now remember: the hand-written message is the crowning jewel of every cake, and should showcase not only your skill, but also how much you care. Lovely, Dana K., lovely. There's no question that Ben felt special upon seeing this. Oh, and class, see how she filled in that awkward blank area with a mass of ribbon? That's called "thinking on your feet." 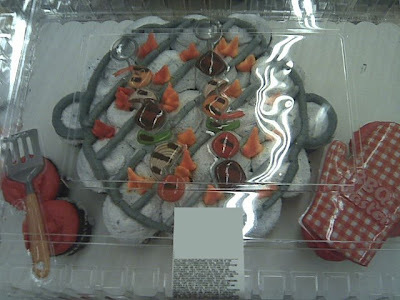 There's no sense in wasting edible decor when you can simply reuse gift wrap you have on hand. Andy B., pop quiz: What do you do when you run out of icing mid-inscription? Do you make more, or simply switch colors and hope no ones notices? Haha, that's correct! Remember, class: Many children are colorblind. And the ones that aren't are generally too buzzed on sugar and caffeine to notice petty things like spacing, spelling, or sperm-like balloons. Now, Erin S., say you have a small cake that someone wants you to write a message on, but you've also been wanting to try out the new 'blob' flower technique you saw on Careless Cakes. Which gets priority: the message, or the blobs? Also correct! 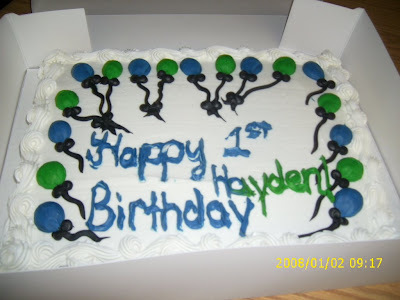 You see, class, this is why it's important to fill the entire cake with your design; so the message you write on top of it is uniformly difficult to read. As an added bonus, it's much harder for the client to spot any misspellings this way. And lastly, Bethany T. is going to show us two things every baker should make more use of: plastic picks and abbreviations. Wow, Bethany; I think that "BS" stands for "Beautifully Scripted!" I like how the color almost matches the birthday pick, too, but is off just enough to clash spectacularly - that took a lot of talent, I know. [bell ringing] Well, that's all we have time for today, class. Remember to practice those blobs for next week's "Plop-a-Flower" review! Wrecks reader Mark B. decided to propose to his girlfriend while they were on a Caribbean cruise last August. Like all good guys, he wanted to do it in a way that was both memorable and a little unique. 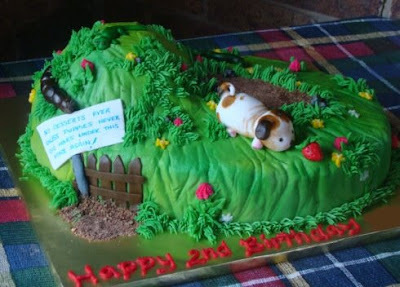 So, after much thought, he decided to use a cake. (Told you he was a good guy.) With that settled, all that was left to do was choose the perfect words to form his request. Well, the night before he planned to propose arrived, and Mark still hadn't decided on an inscription. As he and his girlfriend went for a walk on the beach, though, they came across the very inspiration he'd been looking for. There, written in the sand, illuminated by moonlight, was the word "dork". Ok, so that might not seem like the most romantic of inspirations to you or me, but for Mark it was "a sign". 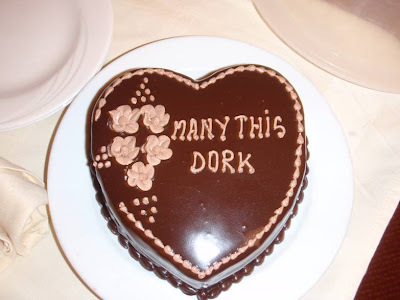 He tells me his girlfriend was always calling him a dork at the time (with much affection, I'm sure), and so standing there that night, he knew exactly what his proposal cake should say. It's Memorial Day, and as every red-blooded American knows, there is only one nationally accepted way to demonstrate your sense of patriotic pride in the men and women who have sacrificed for this country. One which involves fire, hunks of raw meat, and at least one guy in a "kiss the chef" apron cursing out the blippity bleepin' starter switch on the filth flarnin' grill. That's right: It's barbecue time, baby. Is this creative? Sure. 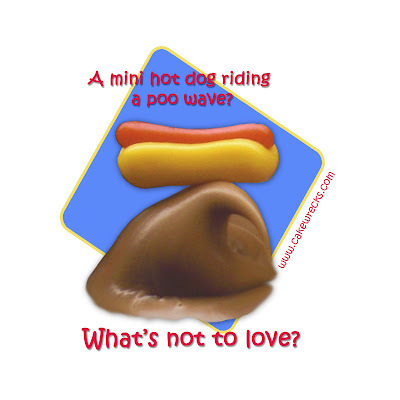 Appetizing? Not so much. 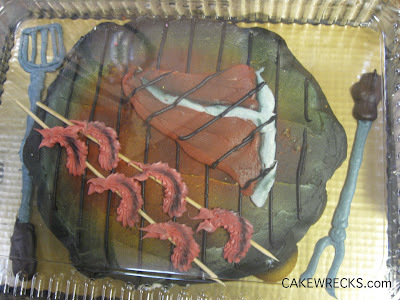 It looks like a giant half-cooked hamburger with steak and shish kabab'ed Elmo fingers on it. [shudder] Great, now I gave myself the willies. 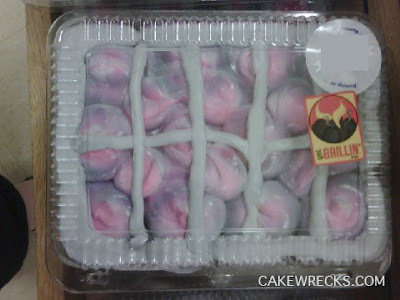 [shaking head] Til the end of time, Wreckerators will be trying - and failing - to make circles out of cupcakes. What's the definition of insanity again? 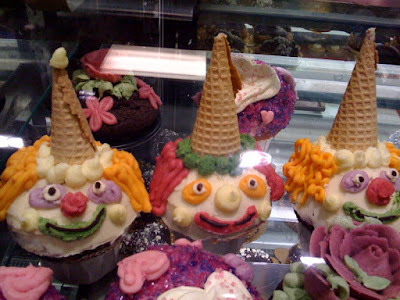 Ah, there's nothing like leprous-looking cupcakes to get the ol' saliva glands going! Huh. Thank goodness for stickers, is all I can say. Oh, and here's the raw, malformed lump that goes on it! Yum! Shannon S., Amy J., Joanna C., & Nichole H., I'm suddenly inspired to find a doll on a grill, just so I can write the caption "Barbie on the barbie". Unless one of you knows a girl named Barbie? You could even turn the grill off, if you like. Hi, all. John here with your weekly dose of Sunday Sweets. This week, we'll be looking at the design staple of bakeries everywhere: the topsy-turvy. 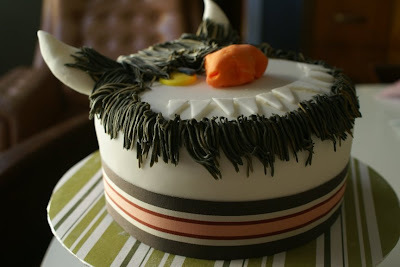 This one's from Design Me a Cake, and is one of Jen's all-time favorites. 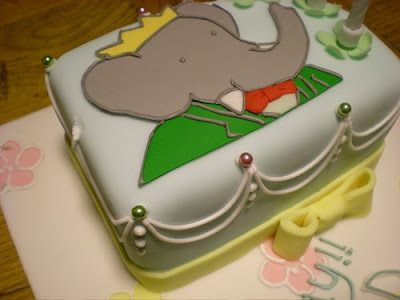 I remember going to the ICES convention at Disney and drooling over the topsy-turvy pans. Sadly, they were like a thousand bucks* so we ended us getting the super-ultra-mini-version for like half a thousand bucks. 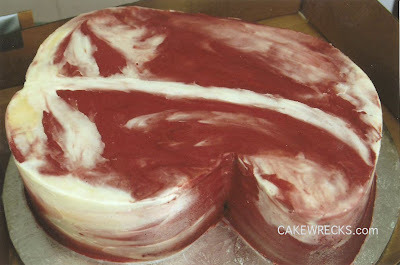 ** It's kind of hard to ice a top tier that's only two inches across, though, so we haven't had much success with it. 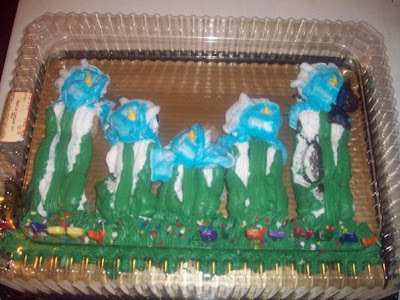 That sidepiece was the only thing supporting the cakes. Crazy. 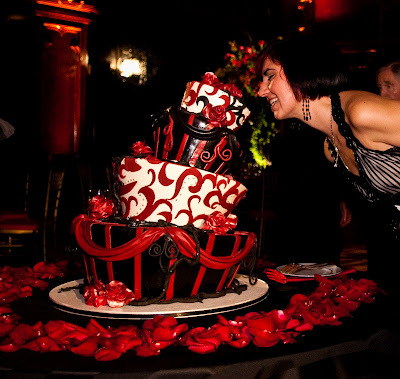 Just goes to show: If the folks at your party have the uncontrollable urge to run forward to try to save the cake, then you have done your job well. 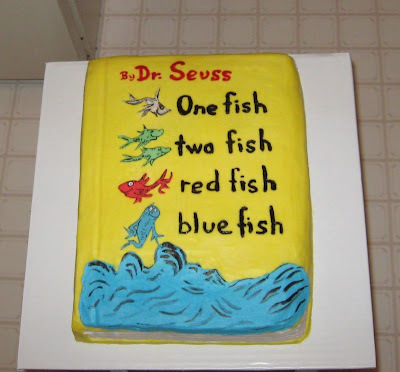 Jen thinks this was the winner - or at least one of the winners - of a Dr. Seuss themed contest over on Cake Central. 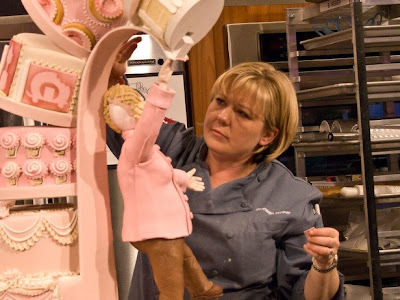 It was made by The People's Cake. Thanks to, ah, Jen for finding most of these beauties. You're a real trooper. * I'm probably exaggerating here. It's always fun seeing what you guys come up with for new shirt designs, and since Zazzle is running a huge sale this weekend I figured I better post these new ones pronto. As with all the truly bizarre, sure-to-confuse-everyone-but-fellow-Wreckies designs, I love it. And it's also available on an apron. Which also looks good in brown for the guys. 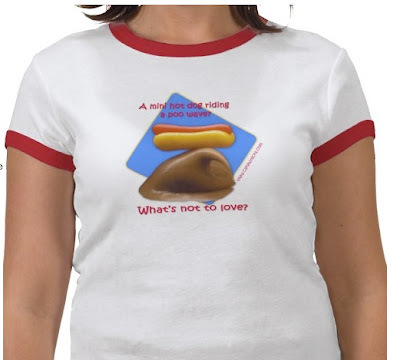 Through Sunday Zazzle is offering 25% off all aprons, and 10% off all t-shirts. That's the best discount I've ever seen them offer for aprons, so if you've been thinking about getting one, now's the time. Here are all the apron designs I currently have for Wrecks, but if there's a design you'd like me to add just let me know. 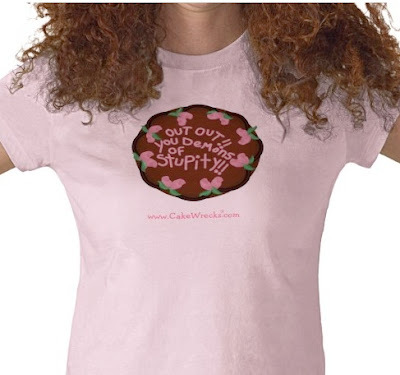 And as always, send your CW shirt designs to comments [at] cake wrecks [dot] com! 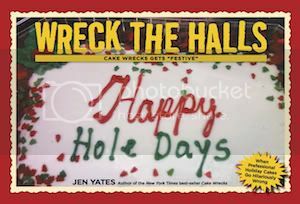 If I post it, I'll give you a shout-out and link to your site both on Zazzle and here on Wrecks. Hope you're all enjoying your holiday weekend! Wreck on! Many of you already follow me on Twitter, but for those who don't (and for you newbies) here's a sampling I think is worth repeating. - "Cake or death?" with Lego illustrations. Very nice. 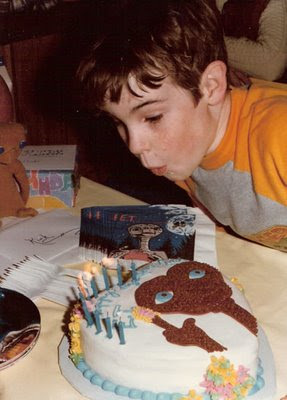 - Here's a nifty trip down memory lane: "My Life in Frosting": http://tinyurl.com/23h8yh ET & Vader & Superman, oh my! 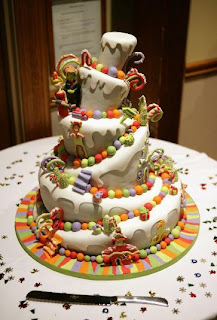 - Cakes that look like poo are bad enough, but on your WEDDING DAY?!? If y'all enjoy today's post I may make "Sweet Tweets" a regular feature here on Wrecks. Thoughts? Questions? Comments? UPDATE: Fascinating. I had no idea Twitter could inspire such strong feelings of dislike! Chill, everyone: I just thought I'd try something a little different for a post. I'm not trying to "sell" you on Twitter or change my usual writing style - I just wanted to share some fun and funny bits for you non-tweeters, is all. I'll be sure to post less material if I try again in the future, though; it seems most of you agree this post is too long. 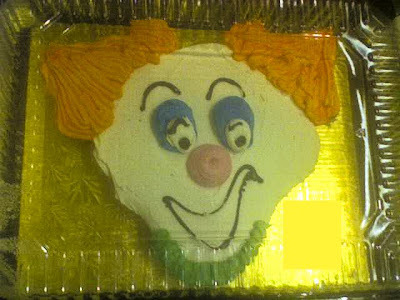 Ah, yes: the great clown massacre of '77. See, now he's only got one hand to strangle you with - much better. "Come closer, little children. Binky wants to play..."
Or are those zombie clowns? Hmm. Better eat their brains before they eat yours, Lulu. Of course Kyle D. is correct: no one put Coulrophobia on the map like Stephen King. 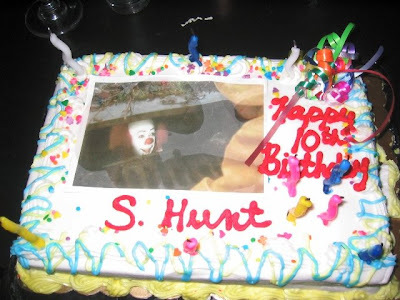 Remember that freaky looking clown from It? Because apparently this baker does. Still, I'm disturbed. Look, I know I'm a wimp when it comes to horror flicks, but the fact that freakin' ten-year-olds are watching It is making me look unusually spineless-blob-of-jelly-like, ok? It's like the first time I got on a loopy roller coaster at age 20: There I was, about to soil myself with fear, while a stinkin' toddler (ok, so maybe he was a tall toddler) sat next to me giggling himself silly. Lucky for him I couldn't pry my white-knuckled hands from the lap bar, is all I can say. Also, how bad does your name have to be that you abbreviate it on your own birthday cake? Sephiroth? Scooter? Sheldon? Scooby? (Yes, my knowledge of silly "s" names is limited to cartoons and video games.) Guys - your nominations? By Popular Demand: More Wreckwear! Do What to the Mayo?